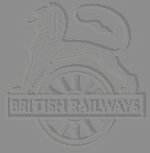 While not being "good" photo's, they are good photo's of British Railways at work, taken at a moments notice when something good appeared. Please enjoy and feel free to use them in whatever way you wish. 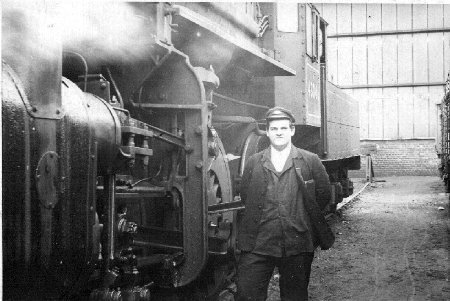 I was just 17 when this was taken at 21A Saltley loco outside no3 roundhouse. The engine is 2-6-0 Mogul 43046. They were good engines, but were very noisey and the cab moved about a lot, the injectors were good too, we used them on the Leicester, Derby and Reddich lines. Welcome to my homepage, I hope in time it will become as interesting to you as it is to me. I started life in Birmingham England in 1944, and moved to Coleshill, Warwickshire in 1946. I went to Coleshill Parocial Primary School and then on to Park Hall School, where, I attained the position of head boy in 1958/59. I worked at Water Orton Railway Station, yards and Signal Box. Joy of Joys I then went to Saltley 21A Locomotive Dept as a fireman on my beloved STEAM ENGINES. Steam is in my blood and from an early age I can remember watching the trains from my bedroom window passing Coleshill Station. The joy of visiting Tamworth Station and seeing the Semi's, Scotts, Pats, Jubs, Prinis and many more roar through on the main or clanger. Or to Birmingham New Street to get up close to the big engines. I recall my firing days at Saltley in the Sheffield/Bristol Link and the coming to Saltley in their last years of the Royal Scott locos and the pleasure of firing them on expresses as well as unglamourous freight trips. I also in later days 1977/83 worked as a guard for BR on the Weymouth/Waterloo trains, which by then were hauled Weymouth/Bournemouth by Class 33 locos and Bournemouth/Waterloo by REP electric units. We came to New Zealand for a better way of life, which in fact we did find, but how I miss my trains.